Marine Corps Sgt. Ethan Mawhinney, a Pittsburgh native and a Marine Air-Ground Task Force planner with Marine Corps Forces Special Operations Command , successfully defended his championship title at the Marine Corps’ third annual HITT Tactical Athlete Competition held at Camp Pendleton, Calif., Aug. 28-31. The competition brings together the top male and female Marines from each Marine Corps installation in a demanding competition of military function and fitness and to promote the advanced dynamics found in the High Intensity Tactical Training program. The competition brings together the top male and female Marines from each Marine Corps installation in a demanding competition of military functional fitness and to promote the advanced dynamics found in the High Intensity Tactical Training program. The HITT program is comprised of seven foundational movements: squat, press, lunge, plank, rotate, pull and push for a full-body, functional workout. After the 2016 competition, Mawhinney checked into MARSOC where he leaned on the physical trainers at the MARSOC Performance and Resiliency program to help fine tune his workout program. The PERRES trainers helped him adjust his training to consist of more explosive workouts, emphasizing heavy lifting versus faster, light-weight lifting and calisthenics. “I worked a lot on explosiveness — little things like short, 15-yard sprints, for training take-off speed,” Mawhinney said. Because the scoring system is based off the time it takes to complete an event, Mawhinney said he didn’t want to lose points by pacing himself throughout the events. Instead, he focused his energy into one daily workout after noticing an increase in injuries resulting from the intense frequency of workouts the previous year. His revamped program featured longer, more intense and harder workouts versus the shorter, easier ones from previous years. Mawhinney added in a second daily workout during the final stretch before the competition. 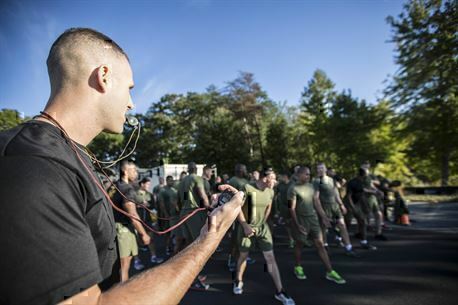 Along with increasing physical fitness, Mawhinney said the competition and the discipline required to train for such an event really bring together some of the best and physically fit Marines. One of the biggest enjoyments for him was the atmosphere provided by those Marines. Mawhinney commented that for him it’s not about lifting and working out to look good, but to be the best Marine he can be an opportunity provided by the Tactical Athlete Competition.